JOE CLARK TO GIVE WINEGARD LECTURE | Chatham-Kent Agriculture Development | We Grow For the World! 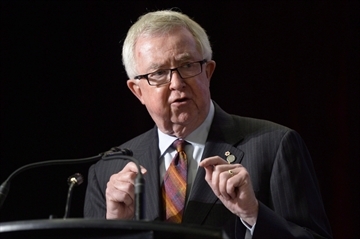 Joe Clark, Canada’s 16th prime minister and former secretary of state for external affairs, will speak as this year’s Winegard Visiting Lecturer on International Development at the University of Guelph. Clark’s lecture “Leading From Beside” will take place Oct. 27, 5:30 to 7 p.m., in Rozanski Hall, Room 101. He’s expected to discuss the growing importance of middle powers in international development. The event is free and open to the public. Clark served 25 years in the House of Commons and was prime minister in 1979-80. He led the former Progressive Conservative Party from 1976 to 1983 and from 1998 to 2004. He served as minister of constitutional affairs and acting minister for national defence and justice. Currently vice-chair of the Global Leadership Foundation, Clark teaches in McGill University’s Institute for the Study of International Development. He’s the author of Canada: A Nation Too Good to Lose and How We Lead: Canada in a Century of Change. Clark is a Companion of the Order of Canada. The Winegard International Development Lectureship was created in 2005 with an endowment from former U of G president William Winegard and his family. Winegard served as Guelph MP from 1984 to 1993. He became Canada’s first minister of science and served as parliamentary secretary to the minister of international trade. He was named an Officer of the Order of Canada.